Yesterday’s The Flash episode “Out of Time” ended with Barry accidentally traveling back to the past, wiping out most of the episode’s events. The preview for next week’s “Rogue Time” indicates that while things may seem safe, Barry’s actions will have consequences, both for his loved ones and the time stream itself. Check it out! When the new Weather Wizard Mark Mardon conjured up a tsunami to strike Central City, Barry attempted to create a “speed wall” to repel it. Caitlin questioned whether he was capable running that fast, but Barry proved her wrong…only his speed didn’t have the effect he expected. Instead of stopping the tsunami directly, he traveled back in time to a point after his bowling game with Linda, Iris and Eddie, revealing to both him and the viewers that the image of himself he saw earlier was not a speed mirage as Harrison Wells suggested, but actually his future self traveling back to the past. As a result, most of the events of “Out of time” have been erased, including Barry and Iris professing their love for each other, Wells revealing his true identity, and Cisco being killed. In the preview, we see that Barry is able to capture Mardon before he causes most of his destruction, so that’s a plus. Unfortunately, Wells informs Barry that he ruptured the time continuum, and subsequently time itself will try to repair the damage he caused. In this case, Barry averted one tragedy, but another is on the way. This may explain Eddie’s drastic personality shift by hitting Barry. We saw that Eddie’s starting to realize that Iris may have deeper feelings for Barry, but the changed timeline may be accelerating his hostility towards Barry (whom he sees as a threat to his relationship with Iris), and in the end may lead him down a dark path. 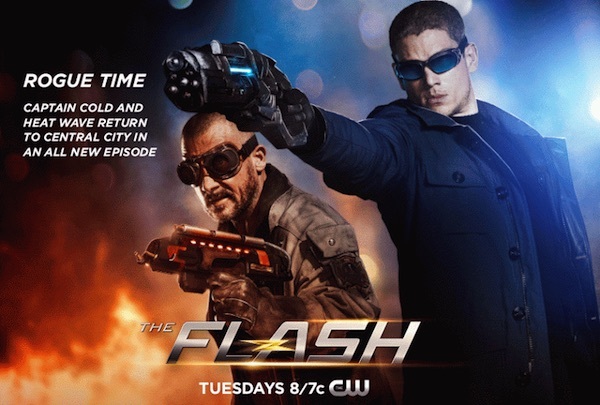 Then there are the villains that next week’s episode gets its name from: Captain Cold and Heat Wave, who were last seen in “Revenge of the Rogues.” Having returned to Central City, they’ll be working with Cold’s sister Lisa Snart, played by The Tomorrow People’s Peyton List, and this time they’re interrogating a still-alive Cisco. Their goal: to find out who the Flash really is, and if the PaleyFest trailer is any indication, they’ll get far on this mission. So while Barry has become more powerful and undone several tragic events, his time traveling will, in the end, have more consequences than upsides.